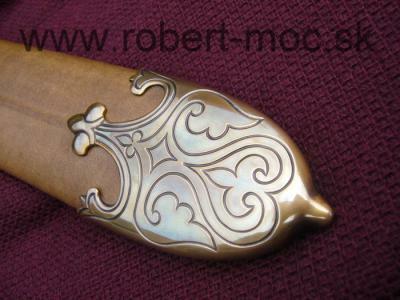 Forum Index > Historical Arms Talk > New Rus type Z by Robert Moc arrives! Posted: Thu 28 Jul, 2011 10:35 pm Post subject: New Rus type Z by Robert Moc arrives! Here's my new one from Robert Moc. 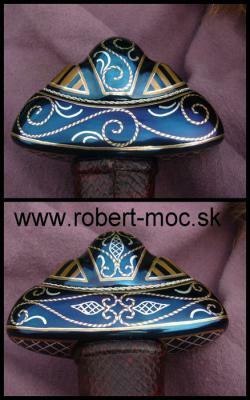 It's a (Rus) viking type z with slavic inlay on it. Pommel and guard are hollow! Grip is snakeskin. Inlay is silver, bronze, and copper, wire between pommel bar and cap is twisted silver. The scabbard is wool lined wood with a leather cover. 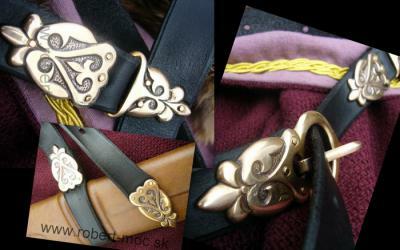 The belt fittings and chape are handmade by Robert from bronze. The scabbard has a silver bead hanging from it. The blade has a small bronze cross potent inlayed on it. I think it is my best sword. I will post some photos I take when I get a chance. Thoughts and comments welcome. Are you kidding me? That's amazing. I would very much like to own something like that. It's pieces like this that make me want to "go early". Tim I wouldn't normally do this but, Id like to ask for your sword's hand in marriage. That's amazing sword you've got! 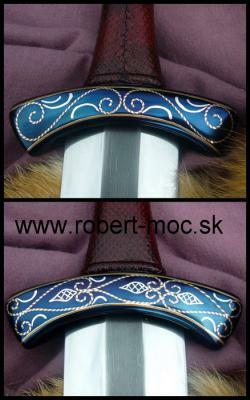 I especially like the inlay on guard and pommel. Can you post some stats and how does it handle when you have it in hand please? I hope you will show us your whole collection one day, you have so many unique swords at home. Lovely. Robert's work is amazing. 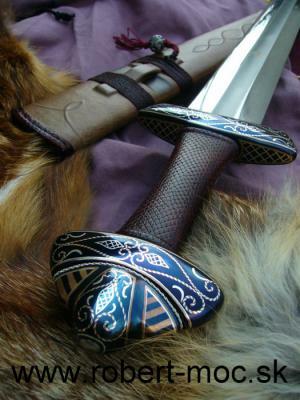 I dont usually bother to post in threads like this, but this is one of the most beautiful swords i have ever seen. Posted: Fri 29 Jul, 2011 5:04 am Post subject: Re: New Rus type Z by Robert Moc arrives! I think it is my best sword. Hell yeah! Well Tim, as you know I admire many of your custom pieces, and some would fit better with my own collection, but lately you are taking things to a new artistic level. In that category, I agree this is your best Viking sword yet. How could it get any better? The first photo alone looks like the cover of a book or the home page shot. I'm usually not drawn to decorations on swords, but this gold-on-black design is so perfectly executed and esthetically right. It's eye-catching and reserved in the same moment. Also, grips don't usually get much attention, but that snake-skin over the narrowing grip is super cool. How about some statistics and a full review on this one? PS - I just love seeing pictures of great swords. You made my morning. I'm way past trying to keep up with you; rock on brother! to make sure nooooooo-body's hands every stain a precious inch ??? correctly sealed case for that sword. It looks like royalty. I love Nathan's response because that sword is so over-the-top awesome it's very reality must be questioned. "I think it is my best sword." Congratulations Tim. Can't wait to see the sword that knocks it out of contention. I'm sure that sword could only be a Robert Moc as well. dare i even suggest you risk such an exsquisite blade but. have you tried cutting with it? im going to agree that pommel is GORGEOUS. Really different and that is its appeal to me. Excellent sword. Profanity and blasphemy! That is a beautiful sword. But there is a big problem with a piece like that.... I wasn't a HUGE fan of the type, but now I am. But wait. All others of the type don't impressive me half as much now. I'm so confused! Congratulations to everyone involved! Maker, owner... Wow. That is simply beautiful. ...try not to throw something at me.... Are you going to cut with it?! It quite literally exemplifies the phrase "Fit for a King"
An extraordinary example of the ART of swordmaking. Not sure what else I can add that others have not already said except to congratulate you on yet another awe inspiring sword Tim! Congratulations on another beautiful sword. This looks like a masterpiece and the hilt is absolutely gorgeous. 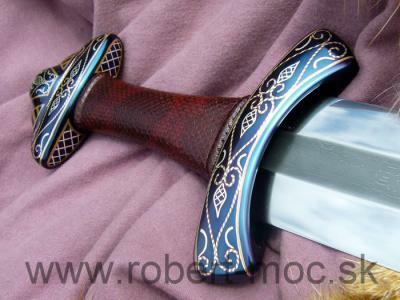 The bronze castings and the scabbard are very beautiful and look extremely well executed. Does Robert speak english and is he from the Czechoslovakia? I am going to give him a try as his work is very impressive and I love his spathas. That is beautiful work and I'm guessing that any usage would have to be " careful " usage if at all to keep the decorations and bluing pristine. Any handling wear over years should be minimized or limited to natural aging or keep it under glass and only touched wearing cotton gloves ? Some natural light patina over decades wouldn't upset me but major scratching or even minor scuffing of the decorations would be something I would want to avoid. 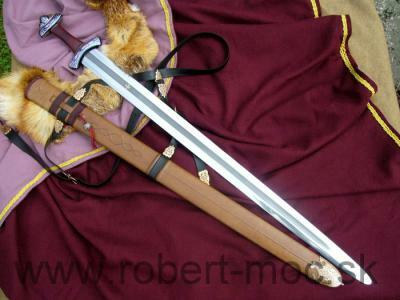 This sword is truely a work of art, and an example of what ma master craftsman can make! I would like you to explane the hollow guard and pommel. Does this help with handeling? In my experience many viking age swords were ment to be blade heavy, for cutting. Do the hollow guard and pommel exentuate that? I have not heard of hollow pommels from this era.